When you think of a hero, what comes to mind? The servicemen and women in the U.S. military might be on your list. When our military heroes need to respond to a crisis, they don’t have time to wonder if everything is going to work properly. They count on the equipment that helps them save lives to function without fail. The U.S. Coast Guard stays busy year-round flying critical life-saving missions. When lives are on the line, teams need to be able to assemble and deploy at a moment’s notice. The machines and equipment they rely on must always be “standing ready” to allow them to act quickly when it matters most. 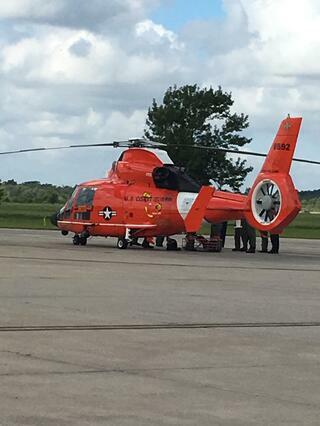 The Coast Guard maintains a fleet of helicopters at a centrally located naval air station. This central location enables the helicopter fleet to conduct emergency search-and-rescue missions and other critical initiatives up and down the Gulf Coast. So, when the time came for the naval base to update their airplane hangers, originally built circa WWII, the question of where to stage the helicopters until renovations were complete became an urgent matter. The Coast Guard immediately contacted Mahaffey Fabric Structures to partner on this project. Why? 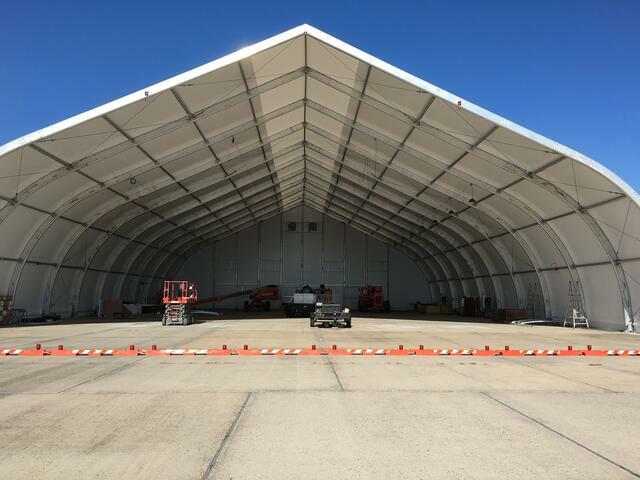 They knew we understand – and are experts in – what it takes to design and build a temporary structure capable of housing an active aviation team. The semi-permanent structure the Coast Guard requested presented several unique challenges. The most critical was the need to replicate and replace the emergency-rescue helicopter team’s permanent hangar. The size of the helicopters meant the instant structure had to meet specific design-dimension requirements. This massive instant structure also had to withstand wind loads of over 150 mph (that’s the equivalent to nearly a Category-5 major hurricane). Another must-have for this project? It had to support the client’s need to deploy FAST. To that end, Mahaffey’s Xtension™ door became a hero of this project. Led by Project Manager Joe Berger, Mahaffey stepped up to challenge with an innovative solution featuring a Mahaffey Tension Series (MTS) instant structure outfitted with a Mahaffey Xtension™ door. Mahaffey’s reputation is one of fulfilling clients’ needs for designs that meet or exceed even the most stringent demands. And we are no strangers to the details and requirements that come with aviation or military projects. Our past performances, experience, and extensive product inventory meant that our team could quickly identify the best possible open-ended solution that incorporated the existing pad and met the wind-resistance requirements, ensuring the completed structure was ready for the important task of facilitating emergency rescue. Once the client approval process was complete, our team moved all materials and equipment to the site and completed the structure within the agreed-upon six-week timeline. In an emergency, every minute counts. For an emergency-rescue vehicle hangar, immediate access is the most important door requirement. In this case, the door needed to open quickly to allow the Coast Guard team to deploy at a moment’s notice. 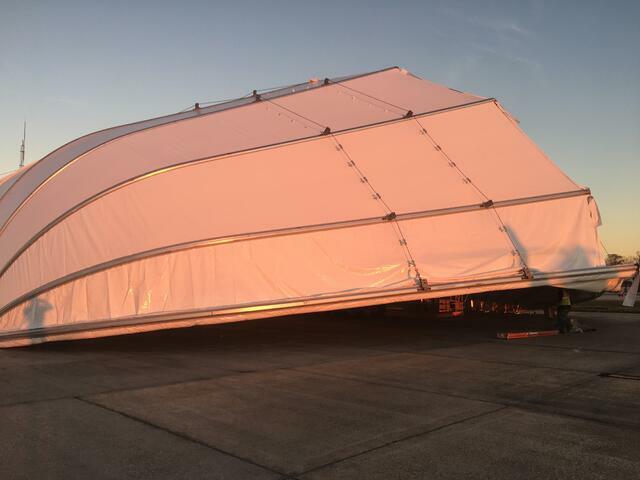 The fully retractable Xtension fabric hangar door was the perfect solution. With Mahaffey’s help, the Coast Guard’s rescue choppers are ready for action and are safely housed in the home-base temporary hangar. Thanks to the engineered MTS Model Tension Series structure and the unique capabilities of the Xtension™ hangar door – mission accomplished! Organizations like the Coast Guard can’t slow down for renovations, and neither can your business. Unique and innovative temporary structures offer long-term and short-terms solutions that help organizations of all types stay on track when challenges arise. Would you like to learn more about innovative solutions for your business? The sky’s the limit! Contact us today to talk about the possibilities.